RoADAR is the abbreviation for name of the “RoSPA Advanced Drivers and Riders” I became a member in June 2012 and hold a Gold Grade pass, The local RoSPA Advanced Drivers and Riders group are the Hampshire RoADAR Group, which in October 2012 I became a member and passed as a RoADAR Tutor in November 2012 and started to train my first associate. October 2014 passed the RoSPA National Diploma in Advanced Riding Instruction. Everyone thinks they're a good rider… right? For some people riding is a stressful chore, while for others it can be a relaxing opportunity to assert themselves. Whichever category you fit into, surveys indicate that 80% of us think that we are above average riders and that accidents only happen to others. But, we probably all know, or have heard about, someone whose life has been changed as a result of a road accident. RoSPA Advanced Drivers and Riders aim is to reduce road accidents by encouraging an interest in road safety, by improving riding standards, knowledge and skill. In order to do this RoSPA Advanced Drivers and Riders have over 50 local groups that will provide free training to help you improve your riding skills and help you train to become an advanced rider. We can all benefit from taking the advanced test. Not only will you receive cheaper insurance discounts you will protect yourself and your loved ones. Riding a bike may be one of the most dangerous things that you will have to do in any one day, let's tackle this together and increase our safety on today's roads. The Happy Biker is a volunteer Tutor for . . . . . Some essential reading literature to brush up previous knowledge and take in some new! 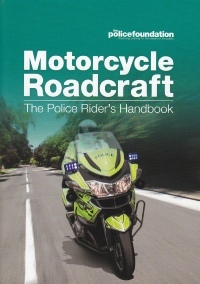 “Ride so that you are able to stop safely on your own side of the road in the distance you can see to be clear”. If you want to train with RoADAR Hants please download, fill out and return an application form at this link.